If are NOT receiving our Cosmetic Specials via email, call us and let us know. Discounts honored during April & May, 2019! INTRODUCING OUR NEW ESTHETICIAN, ESTER LOOP! Savings on the following Treatments: Dermaplaning, Chemical Peels, Specialized Facials, Microdermabrasion. 25% off Packages of 5 or more plus 15% off any retail item – Try our new Epionce products! (applies to non RX only, Latisse not included). Extra special savings on: Theraplex & Blift Sal Acid Peels. Save 30% off 3 or more! And/or 15% off 1 treatment! We’ll schedule you a consult before treatment to determine what’s best for you! 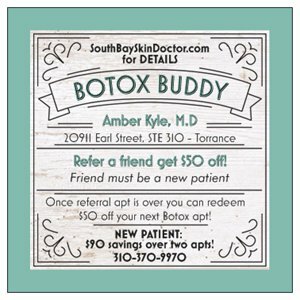 Check out our BOTOX Buddy referral program! Refer a NEW BOTOX PATIENT (who treats), and receive $50 off your next BOTOX treatment! Our new BOTOX patient will also receive $50 off their 1st BOTOX apt and we will match their Brilliant Distinction points on the 2nd visit ($40 value)! ASK FOR A BUDDY CARD & GIVE THEM OUT TO YOUR FRIENDS (write your name on the back of the card)!